Back in the spring, I started to think more about Gina’s diet than I ever had before. I’d never bred a horse, so I was unfamiliar with the nutritional needs of late-term gestation mares. My vet offhandedly said something about adding some alfalfa to her diet to help with milk production, but I wasn’t sure about the details. How much alfalfa should I feed her? How long should I keep it in her diet? Were there particular nutrients I should be concerned about? I also realized that I had no idea what to feed a foal. Obviously, foals nurse for a few months, but what happens after they’re weaned? Google searches and Chronicle of the Horse forums didn’t lead anywhere productive. I knew I could ask my vet, but I didn’t want to call her every other week to ask about something I’d forgotten to ask, or didn’t know I needed to ask. I’ve been using the service for four months, and it’s been helpful to learn what my horses do (and don’t) need! Setting up FeedXL is pretty easy. Each horse on the account has its own profile. You provide details like age, breed, activity level, and current body condition. You can also indicate if the horse has any diseases that might affect its nutritional needs. Next, you add information about your horse’s diet. I guessed at pasture content and quality; I know it’s mixed grass, and I assume it’s average quality. 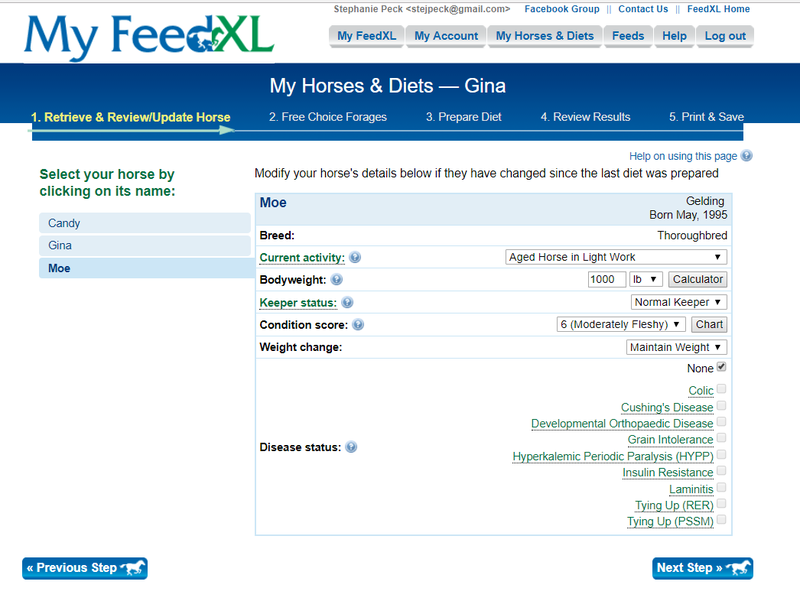 Adding the horses’ other diet components was easy; everything they eat was available in the FeedXL database. 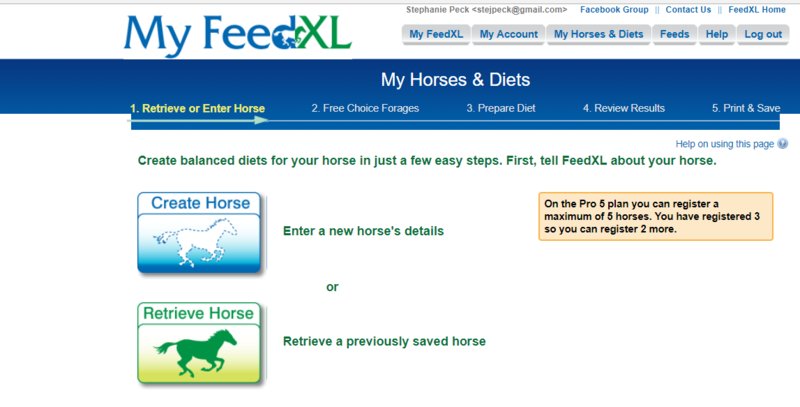 After that, FeedXL provides a report on the balanced-ness of the horse’s diet. If it isn’t balanced, suggestions to fix it are provided. You can set up as many diets as you’d like for each horse. 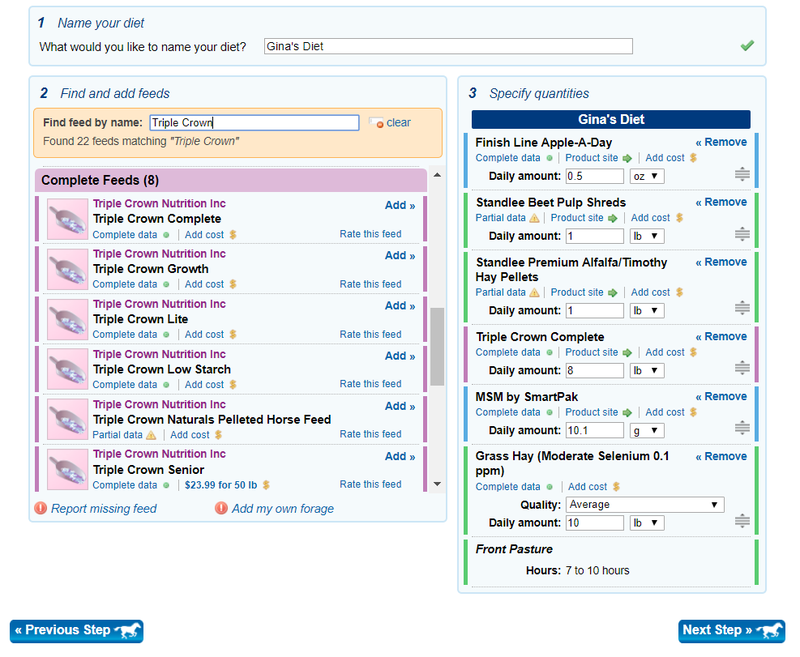 This is really useful for running “test” diets to see how changing components of the diet will affect it. I used it to see if I could reduce feed costs. The report isn’t perfect. Some manufacturers don’t have the ultra-detailed information FeedXL is looking for. For example, the alfalfa-timothy pellets I feed Candy and Gina don’t provide information on the folate content of the pellets. As a result, both mares appear to be slightly deficient in folic acid. 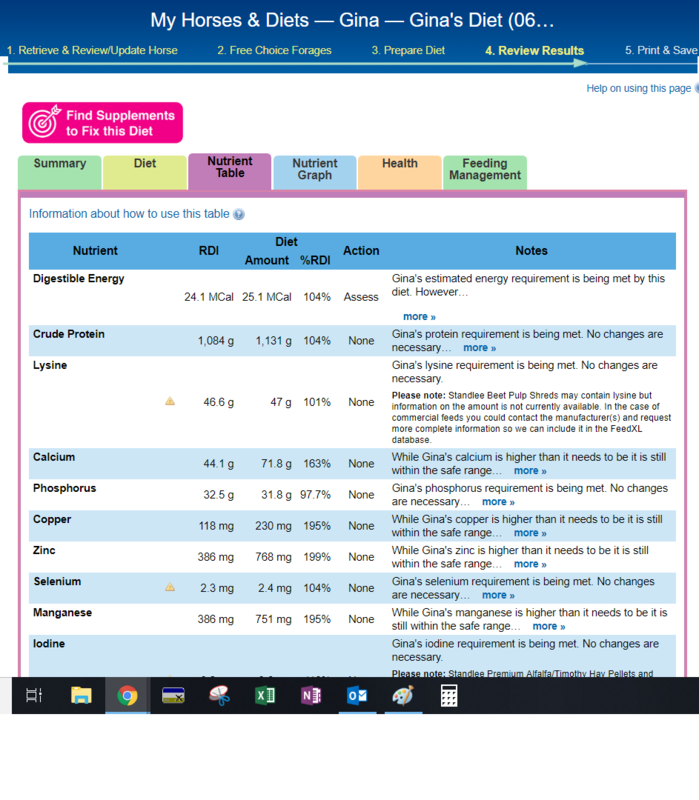 FeedXL notes that “This may or may not be a true deficiency” and goes on to state that “[the pellets] may contain folate but information on the amount is not currently available”. In addition to offering a report on the quality of your horse’s diet, FeedXL also has some general advice on feeding practices and reducing feeding costs. 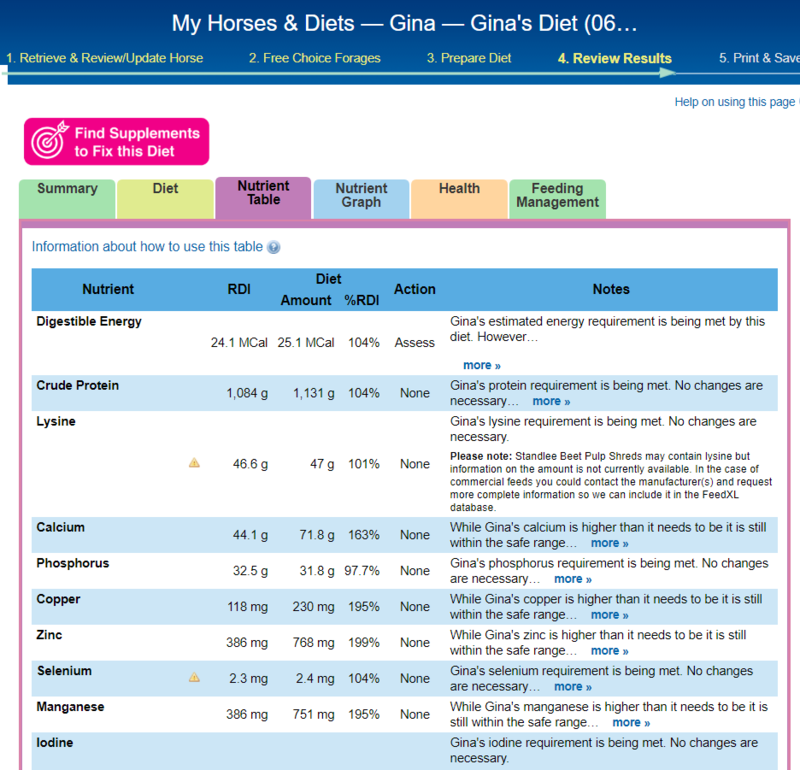 There’s also a supplement finder to address deficiencies your horse might have. The “help” section of the website has lots of information about feeding horses, nutrients and nutrition, nutritional diseases, and how to estimate quality of pasture and hay. Subscribers can also join a Facebook group to seek help from other users. FeedXL offers a variety of subscription levels. There are monthly and yearly options. Price varies on the number of horses on your profile and if you want a basic or full nutrient analysis. The annual subscription for five horses with the full nutrient analysis is $120 per year. I think it’s a good value; it helped me reduce my feed costs and gave me some insight into how my horses can look and feel their best. If you’re concerned about your horse’s diet, curious about whether or not it’s working for him, and have any say in how much or what your horse eats, I would definitely recommend using FeedXL. It’s really interesting and maybe a little addictive! I was not compensated for this review. It’s definitely been useful for me! I created a bunch of test diets for each horse to see if I could reduce the amount of feed (and $$$) I was spending every month. I ended up saving around $87/month by making some relatively small changes. Ohhh I want to subscribe to this so badly. Do you find that you’re using it over time? I can’t decide if I really *need* the year long subscription… but also I am a bit crazy and am already thinking ahead to winter feeding, which is a pretty big difference since it gets so cold. Yes, I’ve definitely used it over time. Right after Gina had Marrakesh, I used it to determine what she needed while lactating. After he died, I used it to recalculate her nutritional needs because she wasn’t going to be lactating much longer. Most recently, I used it to see if I could reduce my feed costs. Turns out that I can add a multi-vitamin to the horses’ diet, cut down on the amount of feed they’re eating, and save myself around $87/month. I’m sure I’ll need to re-run it this winter when they’re off the pasture and totally on hay. I think the annual subscription is worth it! i’ve always been really interested in trying this tool – it seems really neat!! tho now that charlie’s mostly seeming kinda stabilized and doing well, i’m less interested in changing anything haha. but still, there’s so much to learn! It’s such a fun tool, I used it for Carlos and now again for Dante. I’m glad you found it helpful!